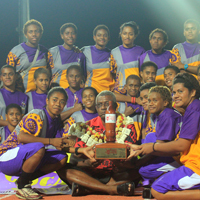 Lautoka city is now planning a major celebration to honor Jasper William High School for creating history in the 2013 Coca Cola Games by winning the girl’s division title. Jasper ended Adi Cakobau School’s impressive 12 year reign and this is the first time ever for the Coke Games girl’s title to go to Lautoka. Jasper won the girls division with 9 gold, 6 silver and 4 bronze. Xavier College finished in second place with 6 gold, 1 silver and 1 bronze. ACS finished in third place with 4 gold, 6 silver and 6 bronze. Saint Josephs Secondary got 4 gold, 1 silver, 1 bronze. Gospel High School finished in fifth place with 3 gold and 1 silver. Natabua followed them with 2 gold and 2 silver. One Response to "Lautoka to celebrate Jasper’s historical win"